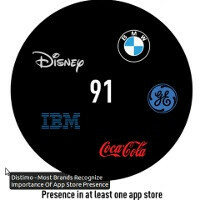 Mobile analytics from Distimo give us some more data to satisfy our hunger for statistics – now, the majority of the top 100 brands have their own apps in one of the bigger application stores. Most of them are present on iTunes. Why is this surprising, you might wonder. Well, because just 18 months ago the number stood at only around 51%. It's also worth mentioning that the top 100 brand list is taken from the Interbrand 2011 Best Brands reports. It lists companies like Coca-Cola, BMW, Disney and IBM, and their brands. Interestingly, though, the Android Market is also quickly getting traction, with distant runner-ups including RIM, Amazon, Microsoft, Nokia and their marketplaces. Not all brands are born equal. Some are eager to flood the markets with apps. Most notable on this list is Disney with a whopping 636 apps and Sony with 285 titles. Only a meager 9% of that top 100 don't have app presence. Among them are fashion brands like Burberry, but also household brands like Kleenex and beer maker Corona. Is an application by a big company strengthening its brands? Apps are everywhere these days and any company large or small can put an app out and call it success but most of the time people are not buying an app to purchase many of these products. Can you buy a coke through the coke app? Certainly not. However, when NFC becomes much more widespread then purchasing through apps and connecting it to reward points, etc will be much more useful. Not now however.